An Overview on Vikhroli Real Estate Market. Mumbai is a city that goes through development each day. Being the economic capital of the country today, Mumbai is known for its commercial activity, modern-day living, social infrastructure, employment opportunities and so much more. Needless to say, living in Mumbai is like living a beautiful dream. The real estate sector in Mumbai is booming with several residential and commercial projects today and the growing property demand has created several real estate micro markets. While a number of locations have surfaced over the years, Vikhroli is the new talk of the town. Situated in Central Mumbai, Vikhroli is a suburb that has gained tremendous popularity over the years, turning into one of the most desired residential locations. In fact, a number of investors have turned their attention to this suburb as well. While Vikhroli has a lot to offer, its physical and social infrastructure continues to improve by the day. With modern-day civic amenities, a good network of roads and accessibility to highways, you will also find various transportation facilities that you can pick from according to your convenience. When it comes down to social infrastructure, Vikhroli has gone through an amazing makeover. Today, you will find a number of landmarks like malls, shopping centres, retail outlets, cafes, clubs, cinemas, lounges, bars, restaurants, entertainment zones, supermarkets, banks, ATMs, hospitals, medical centres, colleges, schools, parks, etc. without any hassles. A growth in Vikhroli’s infrastructure has attracted a number of property buyers to the suburb. Home to a number of commercial hubs, Vikhroli is filled with commercial complexes that nest the offices of several MNCs, businesses and brands. A growth in employment opportunities at this location has given it plenty of brownie points. With a number of working individuals shifting to Vikhroli, property demand at this suburb is on a constant rise. It is an undeniable fact that this location has turned into a good investment destination today. While many investors are purchasing property for future gains from the current capital value, many others are renting out their apartments and earning additional income that they can save. This suburb’s real estate micro-market is thriving with a number of projects and property prices in Vikhroli have almost doubled over the past couple of years. Travel through Vikhroli and you will find a number of fabulous residential structures today. However, choosing the right development is very important in order to gain maximum profits. The latest project by Godrej Properties Limited is one of the best options that you will find. 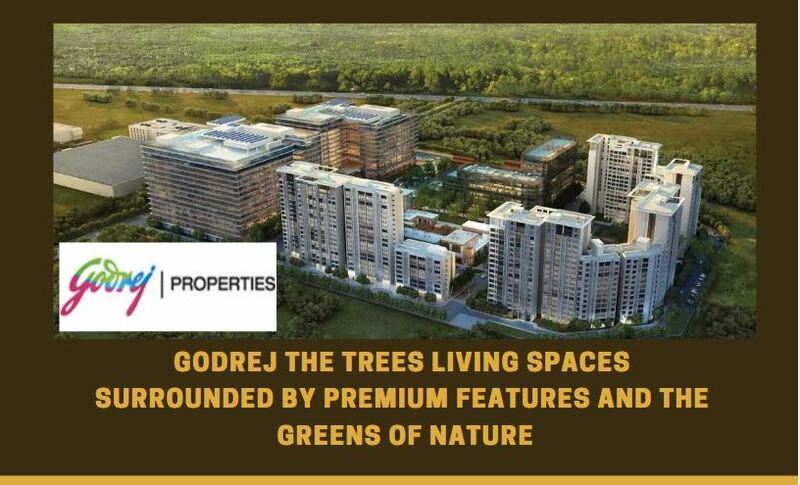 Godrej The Trees is a new residential project at Vikhroli, Mumbai by Godrej Properties limited that sits on a bed of 34 acres and offers 1BHK, 2BHK, 3BHK and 4BHK luxury apartments and penthouses with carpet areas starting from 476 sq. ft. and gradually moving up to 2338 sq. ft. While the apartments are spacious and contain vibrant flooring, kitchens with several provisions, plush doors and windows, safety features and more, you will also find a wide range of external amenities for a comprehensive lifestyle. They include a clubhouse, swimming pool, cafe, indoor games, landscape garden, and car parking facility, Wi-Fi connectivity, open greens and premium security. Starting at an excellent price of Rs.1.44 Cr. and moving up to 9.51 Cr., the residential spaces at this development are cost-effective and definitely worth a buy.